A cute preschool learning adventure starring Diego, Dora's cousin. This computer software works well because kids seamlessly learn about animals as they go adventuring with Diego and Dora. Your preschooler joins Diego as he searches for a wolf pup that is lost in the rainforest. The search takes kids to 10 locations on the way to the rainforest. At each, they will play a game or solve a puzzle to help Diego. For example, at one location, Diego needs help tracking the trail of the pup. When the path divides, kids analyze the different paw prints found on the possible paths. By comparing a picture of what a wolf print looks like to those left on the paths, kids can choose which one to follow. In another activity, kids will be asked to match animals to their pictures, but the pictures only reveal part of the animals. This is an excellent way to encourage children to look for details. As children complete an activity within the rescue mission, it unlocks so that they can play it independently from the mission. Kids also earn a printable Animal Fact Card when they complete an activity. Each card contains interesting animal facts and a line drawing of the animal that kids can color away from the computer. For instance, kids learn that the Three-Banded Armadillo, will "curl into a ball and roll on the ground – like a bowling ball!" 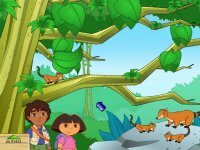 For families looking for good preschool edutainment on their computer, Go Diego Go: Wolf Pup Rescue is an excellent choice. The activities are all age-appropriate and offered on three levels of difficulty. The software doesn't teach young children how to move a computer mouse and click it, but the activities are uncomplicated so that they provide good mouse practice for those new to the computer. The game looks like the television show on which it is based; and because Diego and Dora reinforce certain concepts in English as well as Spanish, preschoolers will learn a little Spanish as they play. 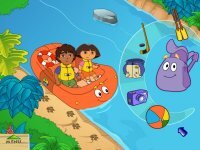 Kids will also learn a lot about animals, and one particularly clever activity even teaches preschoolers about the concepts of "left" and "right" as they steer Diego and Dora down the river in a raft. While most preschoolers will enjoy finding the wolf pup more than once and will like playing the activities, the game includes only one mission; so the longevity of the software is somewhat limited.